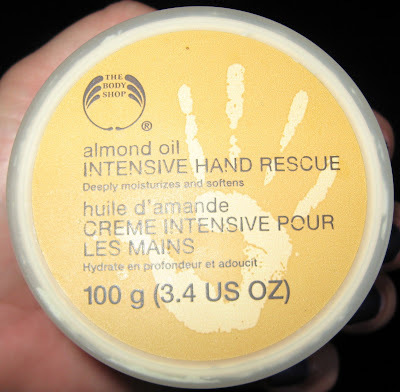 Above & Below: The Body Shop's Almond Oil Intensive Hand Rescue gets a big thumb's up from me. The consistency is just right, it smells so good and it works! You can find my review below. 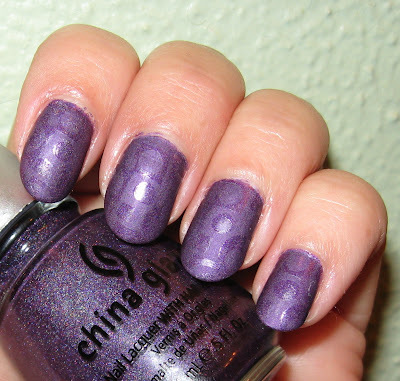 Below: China Glaze LOL from the OMG Collection. 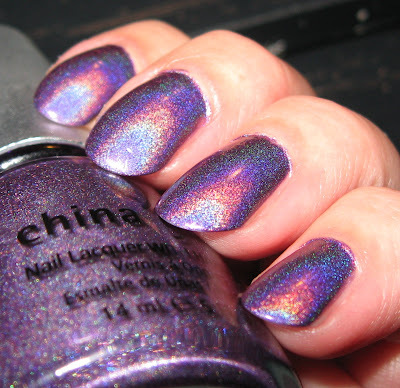 A beautiful shade of purple with blue and red sparkle and a powerful holo. 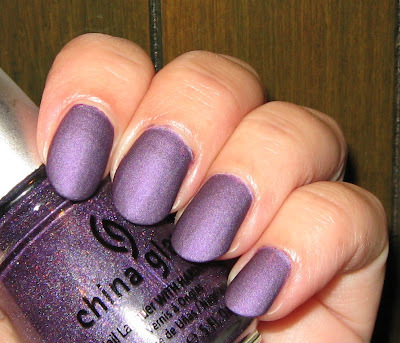 Below: China Glaze LOL with a coat of Essie's Matte About You. It reminds me of Grape Crush soda. Below: Konad stamp m65 using Essie's clear 3-way Glaze for the stamping polish. Good morning! I hope everyone had a wonderful weekend. I've been trying to go through some of my products, use them for a long enough period of time to allow me to form a 'yay' or 'nay' on them, and then share my results with you. One such product is The Body Shop's Almond Oil Intensive Hand Rescue. My hands and cuticle area take a beating some days when I find myself out doing yard work without gloves, doing dishes without gloves, using acetone 5-6 times a day on my nails depending on how many polishes I'm swatching, and so on. I had been using various hand lotions until I came upon this product. I use it nightly before bed without fail, and any other time during the day, when I remember to! The scent is a nice almond one and the texture is medium, rather than too thick or too thin. It absorbs nicely into the skin and leaves my hands not only soft and smelling good, but seems to repair obvious dryness immediately. 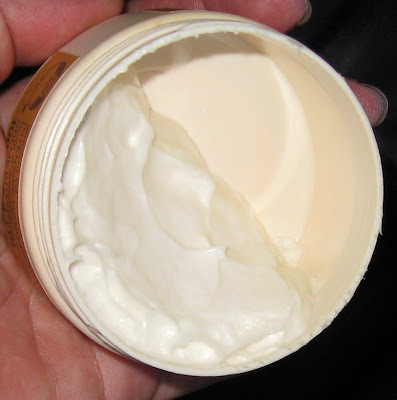 In addition to almond oil, it also lists Shea butter as a primary ingredient, along with glycerin to lock in moisture. Lanolin, vitamins A, E and F can also be found in this product, so it's packed with all of the ingredients you need to soften and repair the damage that our hands suffer. It seems to last all day long, leaving the skin on my hands looking supple and nourished. They recommend using it as an overnight treatment with gloves, but I use it daily and at night in the normal fashion that you would use a hand lotion, and I've been very pleased with the results. This retails for $18.00 for a 100g or 3.4 oz. jar, but I found it for a several dollars less using the link above at the Pebble.com 'search, shop and save' site. I wanted to use the last of my China Glaze OMG polishes before I moved onto the next batch of polish from my recent Victoria Nail Supply haul (China Glaze Get Down Tonight collection), so today I have LOL for you. This is another fantastic holo polish and after trying 3 of them, I'm hooked! I then matted it to show you how that would look, then before removing it I used a Konad plate (# m65) with clear polish (Essie's 3-way Glaze) for the stamping impression. The clear brought out a bit of the sparkle from the original colors in LOL and although a subtle design, I thought it was a little bit unique to have the two different polish finishes. Hi Mary! Couldn't leave a comment yesterday. Kept getting that site error. The holo polish looks gorgeous matted. I love the Konad design. Your nails look insane! I love anything that smells like almond. I can't buy anymore cremes since I have a ton of them. I bought so many from Bath and Body Shop went they have their good sales. Wow, that konad design/nail design is genius! Now I definitely want to get matte about you so I can give that a shot. You're so lucky to have found a good hand product. Thanks for sharing, I think I might just check this out as my hands always take a beating too. Mmm I love almond scented stuff too. Yum. And loving LOL on you. That was my favourite out of all the ChG OMGs. 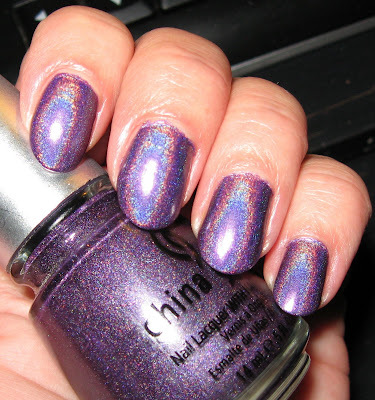 All of these ChGs holos you swatched are seriously gorgeous! And the design you used turned out super cute. I am due for some more good hand cream, I had one a while ago from the Body Shop - it was a hemp cream, a bit pricey but lasted me forever. It was utterly amazing. At that point I was working as a CNA and my hands would crack from being in water all the time - it healed my poor hands! I'll have to head in there and see what I might like, soon. I do love the smell of almond, even if I don't eat them. It smells divine. I really like your koni, what a neat idea to stamp shiny on matte it looks great! I am really pleased with The Body Shop's moisturizers in general. I haven't tried the almond cream, but I will definitely look into it. I've been really good in the past few months about using products I have around. I think my spare funds have been transforming into Konad plates! I love what you did with the shine over matte design. Very cool. WOW! I love how LOL looks mattified; and great Konad job! It looks awesome! Matte about you is definitely a must-have, especially over holos, it looks almost velvety very soft...the more I look at your pictures the more I think this is what OPI Suedes are probably going to look like. Lucy~I don't know what's up with that error, but I get them too on others' blogs. If all goes as planned, I'll be switching to a .com host soon, so hopefully that will help. I have a ton of lotions too. I really like the True Blue Spa lotions from B&BW for my hands. Tiffany~thanks so much. You're so sweet :) I hope you find the matte top coat! Chrissy~I was worried the clear as a Konad wouldn't work, but I like it too! There are plaenty of lotions out there that work well, but I hate spending money on one that doesn't! Nicole~I've looked at their Hemp lotion and it does look like it would be amazing. I may have to try that one sometime. Nail Fanaztic~it's fun with the matte top coat because it gives you a lot of alternatives. And yes, it's definitely trendy right now! Kae~thank you, it was fun playing around with it. I'm slowly starting to use my Konad more and always have fun with it. Diana~I love using things up! I've been using up alot of products too and it's an accomplishment. I only have 4 plates but I'll probably get some more soon. Valerie~I tried using the actual polish as the stamp color so it would be shiny over the matte, but it didn't work at all. This actually showed up much better. Chocaddict~I think that the Suedes will look like this too. We may be wrong, but I think we're right! I absolutely love the Konad finish ! !